Newton Forrest Estate is a partnership between Australian viticulturist Bob Newton and Marlborough winemaker John Forrest and was established in 1988 to make wine from Bordeaux varieties grown in the unique soils of the Gimblett Gravels region. 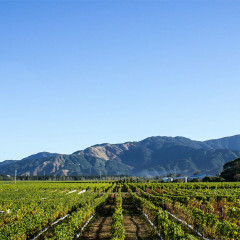 Grapes were planted at the Cornerstone Vineyard on Gimblett Road in 1990 and the first wine, a blend of Cabernet, Merlot and Malbec, was produced from the 1994 vintage. Subsequent production has been based on this blend although latter vintages, which reflect the increasing age of the vines, have allowed the production of varietal Cabernet Sauvignon and Merlot wines.